I was thrilled to get a chance to read Hunted, having recently read Scars (also by Cheryl), and being blown away by that story. Cheryl does it again, and drew me into the world of Caitlyn, a teen with mental telepathy (she can read minds and make suggestions that results in a potentially manipulative effect). The tension resulting from being on the run immediately drew me into the story. I loved the role reversal in the relationship of Caitlyn and her mom. Her mother's powers are mysteriously suppressed and the why is only revealed later on in the story. It creates a strange closeness and dependance of the mother upon her daughter's powers to protect them from being caught, and a distance because of the mother's suppressed powers. I was reminded of such stories as FIRESTARTER (by Stephen King) and other familiar dystopian novels I've read lately (DIVERGENT, THE HUNGER GAMES, UGLIES). These were positive comparisons. Cheryl does not steer clear of the tough issues presented here, and while strongly portrayed, I did not feel it overwhelmed the story. Rather, I felt the issues of acceptance, diversity, celebrating our differences added to the development of Caitlyn's plight. Cheryl created an excellent, modern day love triangle between Caitlyn and Alex and Rachel. While Caitlyn does not mislead Rachel's interest in her as "more than a friend," Caitlyn accepts Rachel for who she is and Rachel accepts that Caitlyn is straight. In fact, Rachel encourages Caitlyn in her interest with Alex, even though it conflicts her. I liked that Alex's ethnicity was not pointed out right away, allowing the reader to identify potential prejudice in the way we judge/perceive/pigeonhole others when we meet them. Whether in the pages of a book or in real life, these are the REAL ISSUES that teens face today. I love how I identified with the message of HUNTED, and I'd recommend this as a great read to anyone. This is the first paranormal book I've read. I love the crossover with the mystery of the Para Reaper and the surprising antagonist, a government controlled para who presents himself differently at first. I also enjoyed the dystopian world, and was pulled in by the way Cheryl incorporates the use of Caitlyn's powers in dialogue, in her relationships with others, and in various plot developments along the way. I was so captivated, I could not put the book down and rushed to read all the way to the end. Fortunately for all of us, this is the first book in a series, perhaps a trilogy or quartet (if I get my wish). I could easily see this as a movie, and will dream of the day when that becomes a reality. I've already started casting it in my mind. I believe you will enjoy this book, and I give it at least 5 stars. Cheryl does an amazing job of cliffhanger chapters and a pace that will keep you breathless, on the run and feeling just as HUNTED as Caitlyn. I was satisfied with the ending, but wanted more. I'm thrilled to know Cheryl is currently at work on the sequel. Give HUNTED a read, and post your thoughts here. I hope this review helps you in your decision to give it a try. 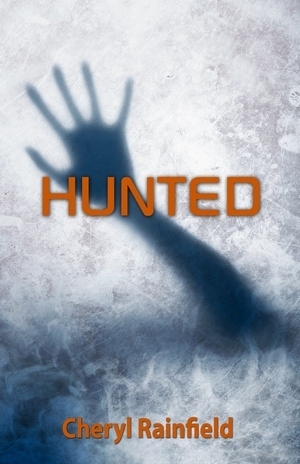 Sign into Goodreads to see if any of your friends have read Hunted. Is this a book for teens as well? Yes, it is a Young Adult book, and is not too graphic, other than some kissing. The violence toward the teens with paranormal powers is cruel, but also written with as little graphic violence as possible. I hope this helps. I would let my teens read HUNTED. I thought it was a great book!